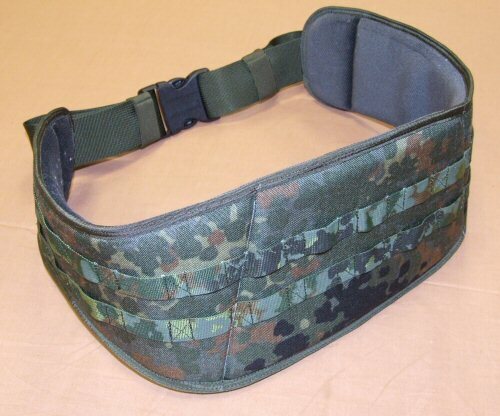 Shaped hip pad in flecktarn for use with the IdZ vest. 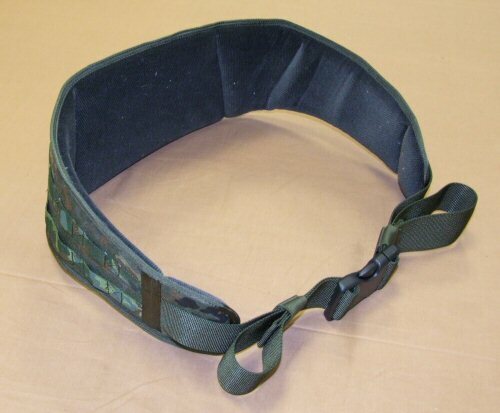 The hip pad is extra wide and provides padding for the lower back and left and right hips for comfort. 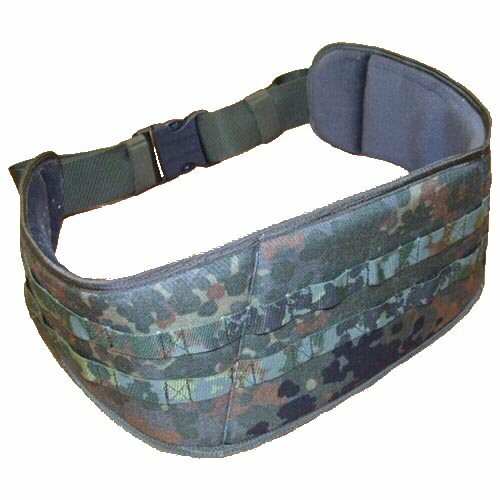 This helps to spread the weight of the load carried on the vest, particularly around the lower back and hip areas on which heavyweight magazine pouches and utility pouches are usually mounted. The hip pad is independently adjustable to suit the wearer. The inside section closest to the body is lined with a soft velour material to help retain its position on the body and for comfort. The outer section away from the body is constructed from texturised cordura. The front closes with a large, heavy duty fastex clip. View of the hip pad from the rear. Also to be seen is the thick cushioned padding to cover lower back and hips and help spread weight around this area. View of hip pad from right hand side. The profile shows how this pad is shaped to provide lower back support and how the sections are formed by stitching in where the belt bends to shape around the lower torso. A wide quick release buckle which is adjustable is provided on the front.